August 03, 1995, LG Crabo & J Troubridge. 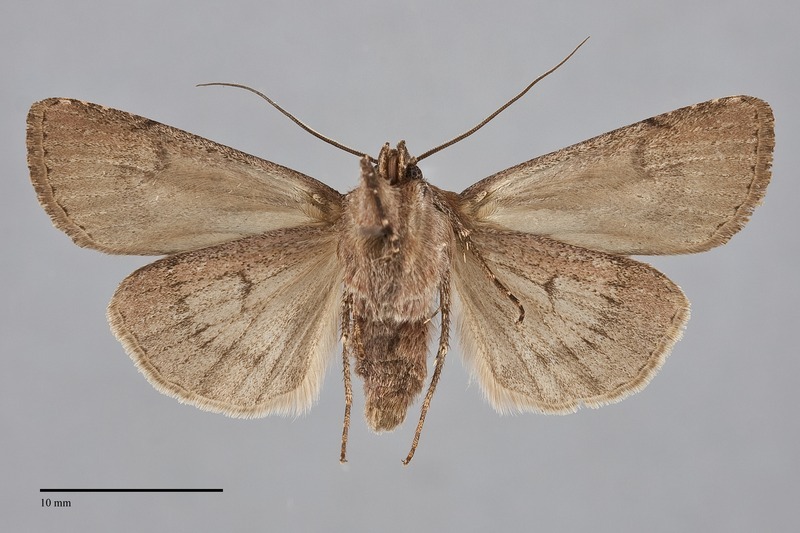 Euxoa trifasciata is a moderately large Euxoa (FW length 16–19 mm) with uniform dull dark orange-brown forewings with black basal, antemedial, and postmedial lines that flies at middle to high elevations in the Cascade Mountains during the summer. The color is nearly even, only the costa abutting the medial subterminal line is darker. The basal, antemedial, and postmedial lines are similar, dark gray to black with strong components abutting the median area and weaker elsewhere, filled with the ground color. The basal and antemedial lines are slightly irregular, oriented nearly transverse to the wing axis. The median line is gray, very faint or absent. The postmedial line is weakly scalloped, slightly drawn toward the base on the costa, weakly excurved around the reniform spot and slightly angled toward the base below the spot. The subterminal line is pale but weak, broken into spots on the anterior wing and absent from the posteriorly. The terminal line is thin, dark. The fringe is concolorous. The orbicular spot is partially outlined in thin black, oval, filled with the ground color. The reniform spot is black with a thin inner lining of luteous scales, kidney-shaped, filled with the ground color. The claviform spot is black, small and narrow, weak. The hindwing is even dark brown-gray with slightly darker veins and discal spot. The head and thorax match the forewing color, with a faint thin dark line across the mid-collar in some specimens. This species is a member of the subgenus Pleonectopoda which is characterized by a twist near the base of the vesica of the male aedeagus. The combination of large size, dark orange-brown color, and limited thin dark markings of this species is diagnostic in its high Cascade range. Euxoa lewisi flies with it at high elevation and is red-brown, but is slightly smaller and glossier. Its forewing pattern is more complex and includes more pale scales in the forewing spots that E. trifasciata lacks. Red-brown forms of Euxoa comosa are also similar, but this species is smaller and its median line is more prominent than that of E. trifasciata. 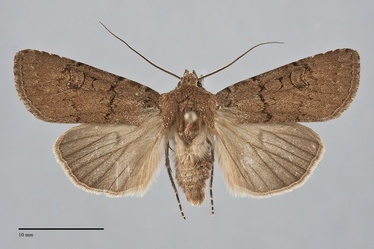 The type locality of Agrotis trifasciata Smith is Mt. Hood, Oregon. Euxoa is a very large genus with many similar species, many of which are also quite variable. The genus is defined by a saccular extension of the valves in males and sclerotized plates on the dorsal and ventral ductus bursae in females. 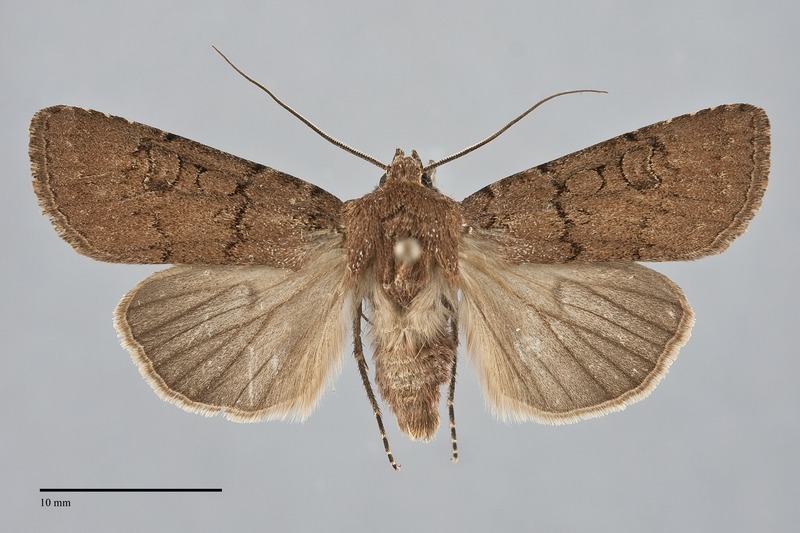 The genus was revised by Lafontaine (1987) in the Moths of North America series and is divided into eight subgenera base on structural characters. These moths are amongst the most difficult to identify. Even though the forewing color and strength of various markings can vary significantly in some of the species, the shape of the lines and spots and the color of the hindwings (often different in the sexes) are more constant. The habitat and flight period are also important in helping to narrow the possibilities. This species occurs at high elevations along the summit of the Cascades and Sierra Nevada ranges along the West Coast, and occupies subalpine spruce-fir forests or subalpine meadows near timberline. It is usually uncommon or rare in this habitat. This species is considered to be management sensitive, depending on disturbed openings and meadows in the forest. Euxoa trifasciata is found in the Cascade Mountains as far north as central Washington near Snoqualmie Pass. The range extends south from the Pacific Northwest to the Cascade Mountains and Sierra Nevada in California to the vicinity of Lake Tahoe (Lafontaine 1987). Euxoa trifasciata flies during the summer, with records in our region from early July to early August.